Tottenham's home Premier League match with Manchester City has been put back one day so it can be played at Wembley. The match will now be played on Monday, 29 October as Wembley was unavailable on the Sunday because of an NFL game. 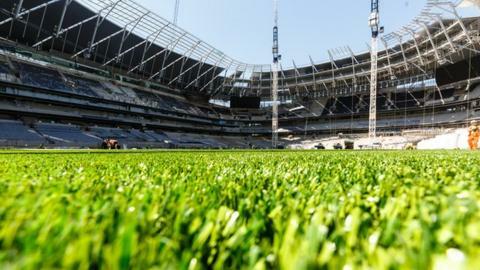 Spurs had hoped to host the champions at their new stadium, built on the site of the old White Hart Lane ground, but "safety issues" delayed its opening. The club also confirmed that all three of their home Champions League group games will now be played at Wembley. The change means Manchester United's home game with Everton is also delayed by a day, moving from Saturday lunchtime to replace Spurs v Man City as the live TV match at 16:00 GMT on 28 October. "We should like to apologise to both our and Manchester City fans for this fixture having to be moved to a weekday evening and any inconvenience caused," a Spurs club statement read. "Despite the possibility that our new stadium could be ready to host this match, this would not be known until much closer to the date of the game. "We have therefore agreed with the Premier League that, in the interests of clarity and certainty, we shall confirm this game as taking place at this time at Wembley Stadium so that fans of both teams can now make travel arrangements accordingly." Tottenham had been due to move into their new home in time for the league match with Liverpool on 15 September, but that match and one against Cardiff have already been moved to Wembley. The north London club had already confirmed their first Champions League home game with Barcelona on 3 October would be played at the national stadium. Their remaining home matches in Group B, against PSV Eindhoven and Inter Milan, have now followed suit. Chairman Daniel Levy said: "We are all focused on ensuring contractors deliver our new stadium in the shortest possible period of time and opening our stadium at the earliest opportunity. "We are now being regularly updated on progress and as soon as we have confidence in our project managers' and contractors' ability to deliver against the revised schedule of works, we shall be able to issue dates for test events and the official opening game." Meanwhile, Spurs will find out on Thursday whether they have got permission to host their Carabao Cup game with Watford at MK Dons later this month.